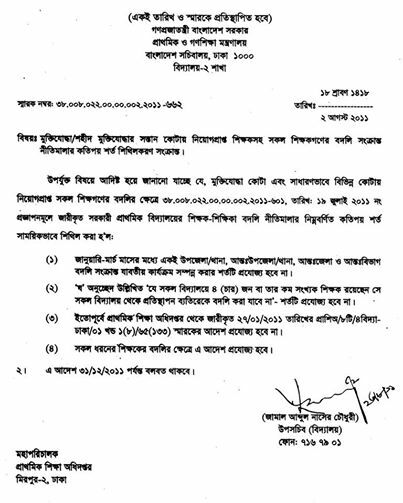 Teacher Transfer Rules of Bangladesh are published here. Teacher Transfer process is a lengthy process and literally you never get it if you cant bribe. A harrased woman named “Sumi” Wrote an article about the “Teacher Transfer Rules and its bureaucracy” in her articles. The teachers of a government primary school may not be highly paid persons. But they are important persons being responsible for imparting formal education at the beginning institutional level of formal education. But they are indeed poorly paid. But it is very hard to have teachers transferred from one school to another. The rules regarding their transfer are very tough. The problem is that their salary being not so high, any of them does hardly have enough money to bribe a high official for a suitable transfer. The teachers who have the ability for giving such bribe can, however, gain from a good transfer. In 2011 Bangladesh Government has published some “Teacher Transfer Rules“. Take a look at it. There is a provision in the primary school teacher transfer rule that a married woman can get the facility of transfer to her husband’s permanent address or near to her husband’s workplace. But it may be an irony that a married woman or man is not transferred to any of the metropolitan cities from outside on consideration of the location of his or her spouse. Thus this has become a controversial policy regarding transfer of primary school teachers. Although it is stated in the policy that a woman can be transferred near her husband’s workplace, she is never transferred to Dhaka when her husband’s workplace is in this metropolis. Where should she then go? So, the policy at its implementation level is self-contradictory. A teacher, especially a woman teacher, should be given the opportunity to be transferred to the metropolitan cities to be close to her husband. I think it is the violation of a major human right that a woman is not usually transferred from outside to the metropolitan cities including Dhaka requiring her to stay away from her husband. Why then do courts entertain petitions for restoration of conjugal rights? I am puzzled. It is my earnest request to the ministry of primary and mass education to enforce the related transfer policy strictly considering the issue of human rights. Nice post.Thanks for share here. Submissing herely that about facing various problems of Primary Teacher’s lives while they ‘re engaged with their duties at workplace. It ‘ll be expressed soon. Thanks great! With best loyality- Arkhan.